Which vitamin C supplement is the best to take? Yolanda Philp is the in-store nutritionist at Nourish Health Food Store. It can be confusing when you walk into a health food store or chemist to buy a good vitamin C supplement and you are faced with 21 brands and a choice of powder, capsules, tablets or chewable tablets – what on earth do you get? I know the dilemma; I am a nutritionist working in a retail store. I have worked in both pharmacy and health shops for years and I see the confused, frustrated looks on people’s faces daily! My customers and clients want to know which vitamin C is the best and why. So here goes…. 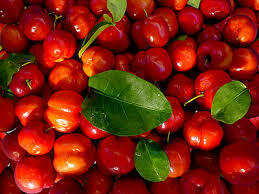 Firstly, you want a natural, food-sourced vitamin C supplement, like Acerola Berry Extract or Camu Camu . Why? Because vitamin C doesn’t occur by itself in Nature – it needs other co-factors to help the body to absorb it and these are found only in the whole fruit. Acerola Berries and Camu Camu have very high levels of naturally occurring vitamin C, plus all of the necessary co-factors, like bioflavonoids. Also, most vitamin C supplements are synthetic. Unless the label says it is from a whole food source, then it is derived from corn glucose. This “ascorbic acid” is made in a lab, often by a pharmaceutical company. Unless the corn is organically grown, or the label states “GMO free”, then the corn will be genetically modified as well. Can you believe it? For those of us who are health-conscious consumers and are seeking the best absorbed, most natural and non-toxic form of vitamin C, without all the sweeteners, additives and fillers, the Acerola Berry Extract or Camu CAmy is the choice vitamin C supplement. It is sold at Nourish Health Food store as powder, capsules and chewable tablets in just two brands, Lifestream, Loving Earthand Blooms, as well as 100g and 200g organic bulk powder form. Lastly, do we need to take additional vitamin C, on top of healthy eating? Yes; I recommend taking at least half a teaspoon to one teaspoon daily of Acerola powder or 3-6 capsules daily to boost immune function, to help with adrenal fatigue and stress, to improve hair, skin and nail growth and appearance, to maintain healthy gums and teeth, to keep bones, joints and tendons strong, to detoxify the body, to prevent easy bruising, to prevent cataracts, to promote healing of wounds, to assist iron absorption and as an antioxidant to protect and heal the body from ageing and diseases like cancer. Kyolic Garlic – a natural antibiotic and cardiovascular king!